There are end number of transactions occur in the normal course of business, where in receipt or payment is made in cash or cheque. To record these transactions the entity uses cash book and contains all the details of the receipts and disbursements that are recorded chronologically. Many times cash book is juxtaposed with Passbook, but there is a slight difference in the two. Passbook is a book issued by the bank to the account holder which records the amount deposited in/withdrawn from the respective account dring a particular period is tracked. It is a snapshot of customer’s account in the bank’s book. With the help of pass book, banks inform their customer about the status of their account. 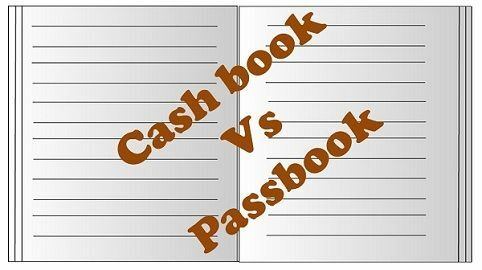 There are a few differences between cash book and pass book which are discussed in this article in detail, have a look. Meaning A book that keeps a record of cash transactions is known as cash book. A book issued by the bank to the account holder that records the deposits and withdrawals is known as passbook. Side affected Receipts will be shown in the debit side while payments are entered in credit side. Deposits will be shown in credit side while withdrawals are shown in debit side. Recording of cheque issued to the creditor Date of issue. When the amount is paid by the bank to the creditor. What do the balances reflect? Debit balance shows cash at bank while the credit balance shows overdraft. Debit balance shows overdraft while the credit balance shows cash at bank. Cash book refers to a business journal in which all the cash transactions of the business are recorded in a sequential manner. The record is helpful in the preparation of the ledger. It is a subsidiary book. However, its cash column and bank column acts like cash account and bank account in which the direct posting to trial balance is possible, so it is a principal book also. Simple cash book: Cash book with cash column only. Double column cash book: Cash book with cash and bank column. Triple column cash book: Cash book with cash, bank and discount columns. Petty cash book: For recording small value transactions, but it i a subsidiary book only. Bank passbook is a book that records the bank transactions in a savings account. It is the exact copy of the customer’s account in the bank’s book. It records the deposits, withdrawals, interest credited, bank charges, etc. during a financial year. The passbook is issued by the bank to its customers. The customer has to retain it and periodically update it to enter recent transactions. With the help of Passbook, a customer can keep an eye on the entries made in his account by the bank. As and when the entries are updated in the passbook the customer can check them and inform the bank, if he finds any error regarding the entries made. Cash book keeps a record of cash transactions. Passbook is issued by the bank to the account holder that records the deposits and withdrawals. Cash book is prepared by the firms whereas Passbook is written by banks and retained by the customer. In cash book, the receipts will be shown on the debit side while payments are entered in credit side. On the other hand, in the passbook, the deposits will be shown in credit side while withdrawals are shown on the debit side. The creation of cash book is optional, but Passbook should be created and maintained compulsorily. The recording of cheque deposited for collection is done in cash book on the date of deposit. However, in the case of Passbook, the same is done on the date on which the amount is collected from the debtor’s bank. The recording of cheque issued to the creditor is done in cash book on the date of issue. As opposed to Passbook, the same is done when the bank pays the amount to the creditor. In the cash book, debit balance shows cash at the bank while the credit balance shows overdraft. Conversely, in passbook debit balance shows overdraft while the credit balance shows cash at the bank. The bank reconciliation statement is prepared that helps to reconcile the two books as a measure of internal auditing. The statement also outlines the causes of non-agreement of cash book and pass book. Got the concept. Thank you very much.